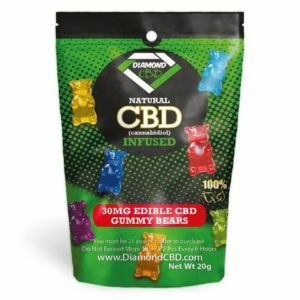 Diamond CBD edible gummies. CBD infused treats. All natural made in the USA. THC free and made from organic industrial Hemp Oil. A fun way to consume your daily dose of CBD. Choose from: Gummy Bears, Gummy Worms, Watermelon Slices, Ocean Gummies, Gummy rings, Mini Fruit, Rainbow Bites, Sour Faces, and Sour Snakes. 30mg cannabidiol per gummy. 20g wt bags.